I didn’t plan it this way but my 500th review on Amazon was a book by IP Factly called Orca Killer Whales so I thought I would share it with you. As IP correctly states, the Orca is actually not a whale, despite its name but is a member of the dolphin family. 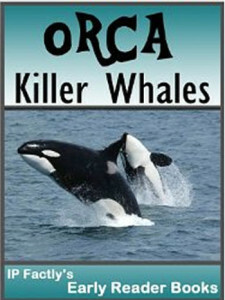 As an aside, I also read and reviewed an AWFUL book on whales today classing the Orca in with the toothed whales. I have reviewed several of IP Factly’s books and we use them here in our homeschool. On the whole they are EXCELLENT! Yes, they are only available as an ebook BUT did you know that you can download the Kindle App onto your computer? You can then read the book on there if you do not have a Kindle. In some of his books he writes about evolution as a fact rather than theory BUT the two I reviewed today – Orcas and Netpune were free of that. The books are well-written and illustrated. They are not dumbed down so the kids can learn a lot. This set of books are for younger reader but there are also books for older kids too. You can visit the IP Factly website here. This entry was posted on Saturday, March 1st, 2014 at 8:52 pm	and is filed under Science. You can follow any responses to this entry through the RSS 2.0 feed. You can leave a response, or trackback from your own site.